The S.C. Department of Natural Resources, in partnership with the S.C. State Chapter of Ducks Unlimited and the S.C. Department of Corrections, will continue the construction and distribution of wood duck boxes this winter. Applications are available online at: http://www.dnr.sc.gov/wildlife/waterfowl/woodduck/index.html and will be accepted until Nov. 1. About 1,000 boxes will be available for distribution. The South Carolina Chapter of Ducks Unlimited will contribute the cost of predator shield fabrication, and the Wateree Correctional Institute in Kershaw County will assemble the predator shields and construct the boxes. Each unit will consist of a predator shield and assembled box. Applicants will be responsible for providing the hardware and 10-foot, 4-by-4-inch posts necessary for properly mounting the box and predator shield. The wood duck is the most important waterfowl species in South Carolina and is the only duck whose breeding habitat can be managed effectively throughout all geographic regions of the state. The project supplements natural production in tree cavities of forested wetlands by providing artificial nesting sites. Fewer natural cavities are available today because of the impacts of human activity upon bottomland hardwoods. 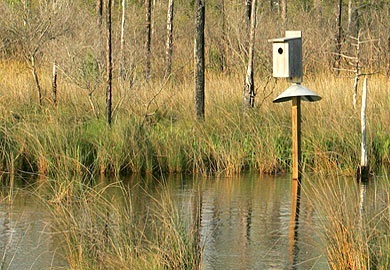 Private landowners wishing to obtain wood duck boxes can download an application by visiting the SCDNR website at: http://www.dnr.sc.gov/wildlife/waterfowl/woodduck/index.html. For more information contact the Statewide Wood Duck Box Project at (843) 844-8957. Up to five boxes per applicant (or property) will be available for distribution throughout the state. The application deadline is Nov. 1. The statewide project for construction and distribution of nest box units to requesting landowners began in 1982. Since 1982, more than 35,000 nest box units have been issued to cooperators around the state.